Flight inspection has long been a vital part of providing a safe airspace system. The concept is almost as old as the airway system itself. The first U.S. flight inspectors flew surplus open-cockpit biplanes, watching over a steadily growing airway system predicated on airway light beacons to provide navigational guidance. The advent of radio navigation brought an increased importance to the flight inspector, as his was the only platform that could evaluate the radio transmitters from where they were used: in the air. With the development of the Instrument Landing System (ILS) and the Very High Frequency Omni-Directional Range (VOR), flight inspection became the essential element in guaranteeing the safety of the system. Flight inspection developed through various government agencies charged with air safety: the Aeronautics Branch, Bureau of Air Commerce, the Civil Aeronautics Agency, and lastely, the current FAA. Flight inspection in the U.S. began in function, if not yet in form, with the development of an airway system in the late 1910’s and early 1920’s. The infant airways were created at the behest of the U.S. Air Mail Service, then operated by the Post Office Department. The Post Office developed the concept of the airway to provide a reliable means of safely transporting the mail by airplanes on predetermined routes and schedules. The term "airway" was very loosely construed, as there was no actual route specified, nor were there any means of aerial navigation provided. There were no aeronautical charts, no terrain or obstruction information, and no radio capability for weather, communication, or navigation, much less anything resembling air traffic control. There was no civil aviation authority at either the state or federal level. There were no flight rules nor, at that point, a real need for them. Airplanes and pilots were unlicensed and anyone with a self-perceived skill could build his own version of a flying machine and sell it to anyone who wanted an airplane. With the lack of effective aeronautical navigation, operations were limited to daytime flights in good weather, obviating most of the advantages held by the airplane as a transportation medium. The mid-1920’s saw the beginning of federal navigational aids as efforts were made to provide lighted airway beacons along the airways to allow safe nighttime navigational assistance. Drawing upon the methods of marine navigation, airway beacons were developed by the Post Office. The earliest lighting consisted both of rotating beacons and fixed course lights. The beacons were placed 10 miles apart and the 1,000-watt lamps were amplified by 24-inch parabolic mirrors into a beam exceeding one million candlepower. They were mounted onto 51-foot towers anchored on 70-foot long concrete-slab arrows, painted black with yellow outline for daytime identification and pointing along the airway. Course lights were also mounted on the light towers, projecting a 100,000 candlepower searchlight beam alng the airway course and flashing a Morse-code number between one and nine that identified the individual beacon along a hundred mile segment of airway. Intermediate landing fields were spaced every 30 miles along an airway. These fields were primarily used for emergencies during poor weather or for mechanical difficulties. Pilots could locate these intermediate fields at night by green flashing lights installed on the nearest enroute airway beacon. A transcontinental airway segment between Illinois and Wyoming was equipped with the beacons and nighttime service was begun on July 1, 1924. Additional segments were lit both east and west, and the entire route, from New York to San Francisco, was completed in 1929. The passage of the Air Commerce Act of 1926, transferred the airway system to the Department of Commerce, which created an Aeronautics Branch with an Airways Division. The last segment over the California Sierras, with the most difficult terrain was completed by the new Aeronautics Branch. With the installation of radio navigation aids, the Airways Division established airborne flight inspection as a safety requirement and by 1932, six pilots were employed by the branch as airway patrol pilots. These six pilots and the operations they conducted were the real predecessors of flight inspection as it is known in the U.S. today. The first practical radio navigation aid, introduced in 1928, was the low frequency Four Course Radio Range. The courses from several ranges could be aligned to provide airway guidance. Pilots listened on their radio receivers to the transmitted signals, a combination of a Morse Code "A" (dot-dash) and "N" (dash-dot) letter, so that an on-course signal was a steady tone. This new aid, rudimentary as it was, nonetheless created the first all-weather airways. The four-course ranges required airborne evaluation of the radiated signals, particularly in proper airway alignment of the four courses (minor adjustments were made by imbalancing the power output from the four antennas used to transmit the courses) and checking for false courses. An article in the Air Commerce Bulletin in 1933, explicitly outlined the responsibilities of the new airway patrol pilot positions. In the description can be seen the developing mission of flight inspection. It noted that "their chief duties are concerned with such matters as checking relative brightness and elevations of beacon light beams; orientation of radio range courses and transmission of proper signals; correctness of speech and transmission of weather broadcasts to planes in flight; operating principles and procedure of airways radio stations in carrying on communications with aircraft; reception of marker beacons and 2-way radio communication service from the marker beacon stations; the functioning of the facilities and condition of landing areas at Department of Commerce intermediate landing fields, and investigation work pertaining to all phases of aeronautic facilities on the Federal airways system." Each of the airway patrol pilots were assigned 3,000-3,500 miles of Federal airways to patrol. The pilots were assigned to a Lighthouse district and patrol offices were established within that area. The Airways Patrol Headquarters were scattered at offices spread across the country. A variety of aircraft were initially assigned to the patrol pilots. 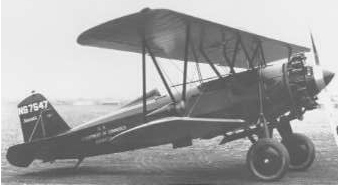 The early patrol fleet apparently consisted of five Bellanca Pacemakers, a Curtiss-Wright Sedan-15, several Stearman C-3Bs, and three Stinson SM-8As. Three earlier Douglas M-4s were phased out by the end of 1930. Most of the aircraft were utilized for both airway survey work and airway flight inspection. Patrol work continued in limited fashion through the balance of the 1930s, constrained primarily by Depression-era budgets despite the mushrooming air transport system and proliferation of radio navigation aids. 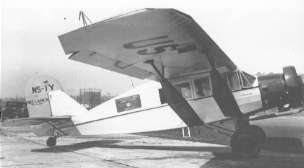 The early flight inspection fleet was nonetheless slowly supplanted by newer equipment such as the Stinson SR-8B with an electrical system to handle required radio equipment. In 1938, the Bureau of Air Commerce was reorganized as the Civil Aeronautics Authority, with newly established administrative Regions given charge of flight inspection within their own area. In 1940, the Civil Aeronautics Authority gave way to the Civil Aeronautics Administration (CAA) establishing an organizational framework that has carried forth to the current FAA. With U.S. involvement in World War II looming, flight inspection remained a relatively small organization within the framework of each of the regional offices. Each of the eight regions was apparently allowed two patrol pilots. The Flight Inspection sections, although administratively assigned to the regions, continued to operate under the Office of Federal Airways. The Chief Airways Inspector (Flight) was nominally in charge of establishing flight inspection procedures and promoting standardized methods. Aircraft assignment, dispatch and maintenance, however, was maintained by the Aircraft Control Service that had jurisdiction over the entire CAA fleet, with the exception of those at the Experimental Station. Beginning in 1940, ten new twin-engine Cessna T-50 Bobcats were purchased for use in the flight inspection fleet, and an additional five were purchased in 1942. There is little information about how these aircraft were modified for the flight inspection mission except that airway patrol pilots of 1944 found them woefully inadequate to perform the job. The recorded minutes of a May 1944 Airway Patrol Pilot meeting termed the assigned aircraft "entirely unsatisfactory, and in some cases, actually extremely dangerous to use for this kind of work." It went on to note that the aircraft created a "bad impression" among air carrier pilots because the limitations of the Bobcats often precluded facility checks in instrument weather or at night. The remainder of the flight inspection fleet consisted of outdated Stinsons purchased in 1936 and 1937. Other items of interest divulged in the minutes for that meeting was the call for the hiring of a third airway patrol pilot in each region to help relieve some of the workload. As of July 31, 1941 there were 30,913 miles of airways with another 1,945 miles under construction. Since only 16 airway pilots were assigned to inspect the airway structure, and as the radio ranges occupied most of their flight check time, there was little attention given to the airway beacons or radio communication capability. Also, newer inspection requirements for instrument approach and landing procedures were seen as being neglected because of the lack of pilots. Work had been progressing steadily since 1928 on the development of an instrument landing system. In that year, the Bureau of Standards began work on a system for the Aeronautics Branch, incorporating a low frequency loop-type range localizer and position marker beacon. Lt. James Doolittle then conducted a series of demonstration flights resulting in the first successful blind landing on September 23, 1929. 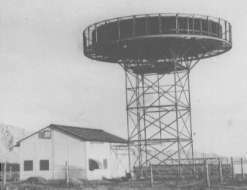 As the conversion to the VHF frequency range was obviously desired, research continued at the Indianapolis Experimental Station, Indiana, where the first modern VHF ILS installation was demonstrated to the military and the airline industry in early 1940. This system incorporated all the elements of the modern ILS, including aircraft instrumentation, that remains in use today. The localizer signal was standardized to use a VHF frequency in the range of 108 to 112 megahertz, while the glide path transmitter utilized a range of 330 to 335 megahertz. Two marker beacons, termed the outer and inner marker, each transmitted on 75 megacycles and illuminated a purple and amber light, respectively, in the cockpit. 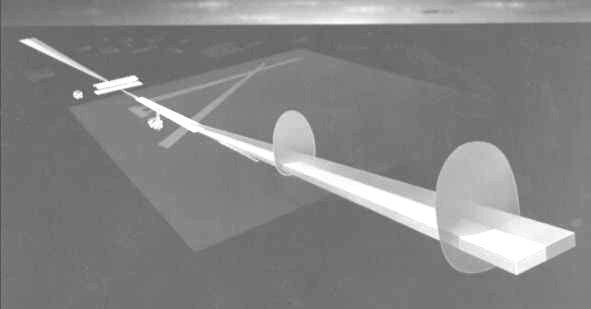 Also installed was a prototype runway approach lighting system for demonstration. Work had also progressed on converting the low frequency airway navigation transmitters to the VHF band. The Visual-Aural Range (VAR) was the first navigation range developed to utilize the higher frequency bands, but even though the VAR system introduced both the VHF frequency band and direct course read-outs to the airway navigational system, it was still limited by the number of courses created by the transmissions. The VAR system was installed on the New York-Chicago airway for demonstration purposes beginning in 1941. However, the shortage of VHF equipment caused by the war effort impeded the aircraft installations and minimized the effect of VHF navigation through the war years. The delay bode well for the development of the first truly versatile enroute navigation system, that being the VOR, under steady development since 1937 but first deemed practical in late 1943. The creation of a rotating radiation pattern transmitted simultaneously with a stable reference signal created an unlimited number of possible courses and made true multi-course VHF navigation a reality. A frequency range of 112 to 118 megacycles was set aside for the new navaid. 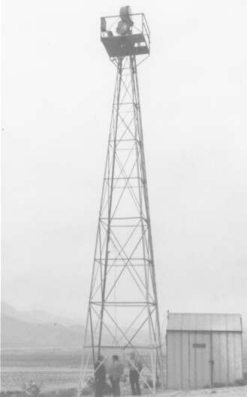 The old four-course radio range was instantly made obsolete with the perfection of the VOR, but continued difficulties in obtaining the electronic equipment and industrial priority during World War II delayed equipment delivery until 1944 and deferred the widespread installation of the VOR system until the late 1940s and early 1950s. When the first VOR airway was established in 1951, over 271 VOR units had been installed and commissioned. By June 1, 1952 over 45,000 miles of airways utilizing the VOR were in operation. Through the early 1950s, the CAA developed a series of ambitious plans for the widespread installation of standardized navigational aids consisting of VOR/DME’s for the airways, plus long-range and terminal radar equipment and ILS’s for airport approaches. The continued growth of civil aviation and the advent of the jet airliner soon pushed airspace problems into the headlines. Several major mid-air collisions, including one over the Grand Canyon in June 1956, pressed the Congress and federal government into making a dramatic new commitment to funding air traffic and airspace improvements. By the end of 1956 an overhaul of the system was begun, with a price tag in excess of $450 million. Also, to explore how VOR’s and other navaids performed at the altitudes new jet aircraft were now routinely flying, the U.S. Air Force agreed to loan two Martin B-57 Canberra bombers to the CAA for high-altitude use. The Air Force pulled two Boeing KC-135s from the production line for fitting as high-altitude flight inspection aircraft for loan to the CAA. The Semi-Automatic Flight Inspection (SAFI) program was developed in the late 1950s to perform long-range airway-type inspection. Five U.S. Air Force C-131 Convairs were obtained and modified with DME positioning information and computerized recorders. All five Convairs were modified with the installation of Allison turboprop engines before they joined the flight inspection fleet. The SAFI program flew predetermined grids across the country looking at each of the enroute VORTAC’s as part of the entire airspace system. Before most of this new equipment had been delivered, Congress passed the Federal Aviation Act of 1958 to overcome differences between the CAA and the military over aviation matters. This legislation created a new independent agency, the Federal Aviation Agency (FAA). The FAA was separated from the Department of Commerce, and assigned the final jurisdiction over civil and military aviation as they participated in the national airspace system. The new FAA faced many problems with the expanding airspace system, but quickly established itself as a technically-proficient, competent authority on aviation matters. In 1959, the U.S. Army and Navy transferred their flight inspection programs to the FAA. The U.S. Air Force, under the prodding of a 1962 Presidential executive order, developed a new sense of cooperation with the FAA and, with "Operation Friendship," transferred much of its own flight inspection capability to the FAA. This transfer included its fleet of Douglas AC-54s, Douglas AC-47s, and Convair AT-29s for the FAA to perform routine Air Force flight inspection. The combat flight inspection mission was retained by the Air Force for its Lockheed C-140 Jetstar-eqiupped flight inspection squadron. One important international aspect of FAA flight inspection operations during the late 1950s and extending through the 1960’s, was the particular emphasis placed upon foreign aid. Under the auspices of the Agency for International Development and other State Department-administered programs, foreign flight inspection programs were developed utilizing the training facilities at the Aeronautical Center. DC-3s, including several drawn directly from the FAA fleet, were modified similarly to the Type II configuration by the FAA and delivered to the foreign governments for flight inspection. In 1965, for example, nine DC-3s and DC-4s, obtained both from FAA and military sources, were provided to the governments of Columbia, Kenya, Mexico, and Vietnam for use in flight inspection or transportation. Other countries that received such assistance over the years included Canada, Spain, Brazil, Greece, Somalia, Argentina, and Chile. The FAA was also instrumental in developing a portable flight inspection package that many nations found more practical to use than establishing a dedicated flight inspection aircraft fleet. The early 1960’s were primarily devoted to standardization of the flight inspection mission across the regions and solidifying the gains made in the late 1950s. Installation of new navaids continued at a rapid pace. By the mid-1960s, FAA flight inspection remained organized at the regional office level but was performed from nearly twenty Flight Inspection District Offices (FIDOs) spread across the country. The SAFI program was based at three Flight Inspection Field Offices (FIFOs), with the entire flight inspection program administered from Oklahoma City, Oklahoma, by the Bureau of Flight Standards within the FAA. Other aircraft employed in the FAA fleet included five Lockheed L-749 Constellations for Pacific and Far East flight inspection and several Lockheed TV-2s (T-33) for high-altitude work. In April 1967, another government reorganization occurred, with the independent Federal Aviation Agency transferring to the new Department of Transportation and becoming the Federal Aviation Administration. Beginning in the late 1960’s an effort was made to consolidate the flight inspection fleet organization with a smaller, more efficient fleet. The DC-3s, though still reliable, were deemed too slow for the modern airspace system. Also, new technology using inertial navigation with DME updating and computer analysis was available that made the DC-3 installations obsolete. The FAA purchased a fleet of fifteen Sabreliner 80s to replace the DC-3s, with an additional fleet of five Sabreliner 40s for international work and five Aero Commander AC-1121 Jet Commanders to supplement the Sabreliner fleet. The Sabreliner 80s were equipped with the new Automated Flight Inspection System (AFIS) that utilized modern positioning technology with automated flight inspection analysis. The AFIS eliminated the need for a ground based Radio Theodolite Transmitter (RTT) operator. In 1972, the entire flight inspection program was reorganized into the Flight Inspection National Field Office (FINFO) and removed from most of the regional organizations. With the delivery of the new jet fleet, a dozen of the FIDOs were closed and consolidated to nine FIFOs, seven located domestically with two overseas offices at Tokyo and Frankfurt. In 1975, the FINFO was reorganized as the Flight Standards National Field Office (FSNFO). By 1982, the last regional flight inspection program, long fought-for and retained by the Alaskan Region, was brought into the FSNFO. Shortly afterwards, in the flight inspection program was removed from Flight Standards and incorporated into the new Aviation Standards National Field Office (AVN). AVN later incorporated other elements of Flight Standards including the Airmen and Aircraft Registry. In 1978, the Microwave Landing System (MLS) was selected by ICAO as the eventual replacement for the ILS. The FAA began MLS installations in the early 1980s with flight check Sabreliners performing the initial commissioning inspections of the new navaids. Industry resistance and the advent of new satellite navigation technology has slowed the transition to the MLS, but nearly two-dozen installations remain in service and require regular flight inspection. During the mid-1980’s, in an effort to address fuel conservation and the structural condition of the Sabreliner 80 fleet, a decision was made to purchase a new flight inspection aircraft to replace the Sabre 80. Beechcraft offered a modified version of its Beechcraft BE-300 Super King Air turboprop-powered corporate transport. In 1986 the FAA ordered 19 of the Super King with an upgraded AFIS system, with deliveries commencing in 1988. In 1991, the FAA assumed all of the U.S. Air Force flight inspection mission and accepted the transfer of the six Hawker C-29s (BAe-800) Air Force flight inspection aircraft into its fleet. The BAe-800s are utilized primarily for international flight inspection, supplanting the last of the FAA Sabreliners. Also, in 1991, the Aviation Standards National Field Office became the Office of Aviation System Standards (AVN). Further consolidations resulted in a structure of four Flight Inspection Area Offices (FIAOs) located at Sacramento, California; Battle Creek, Michigan; Atlanta, Georgia; and Oklahoma City, Oklahoma. Satellite offices are located at Atlantic City, New Jersey and Anchorage, Alaska. An International Flight Inspection Office (IFIO) was established at Oklahoma City to perform the world-ranging FAA flight inspection mission. With the 1990’s came also the development of Global Positioning System (GPS) technology, promising a new satellite-based positioning navigation source now slated to replace many of the ground-based navigation systems in the next decade. Hundreds of new non-precision instrument approaches based on the new GPS technology are being developed and flight checked each year, with work underway to add the capability of precision GPS approaches with ILS-type approach minimums in coming years. In the mid-1990’s, the FAA flight inspection fleet was supplemented by the purchase of a number of new Lear 60’s and Challenger 601’s, bringing the total FAA flight inspection fleet today to eighteen Beech BE-300F’s, six British Aerospace BAe-800’s, six Bombardier Lear 60’s, and three Bombardier Challenger 601’s, each equipped with an updated AFIS system utilizing GPS-positioning. Additionally, a number of Beechcraft Barons are being employed for regional engineering test programs for new navaid installations with portable flight inspection packages installed as required. Today, FAA flight inspection routinely inspects thousands of navaids and instrument procedures, including ILS, MLS, VOR, DME, TACAN, GPS, NDB, various radars, and airport lighting. Continued advancements in avionics with Flight Management Systems (FMS) combined with GPS positioning and other, new high-tech possibilities for aerospace navigational and landing aids suggest an increasing role for flight inspection in the future. Despite the relentless march of technology, there remains the same need for an airborne evaluation of aviation navigation aids and procedures as was established by the original air mail pilots over seventy-five years ago.